Like many composite companies, we often find ourselves in a position where we really have to work out the best solution to a process problem or issue. Where existing solutions do not meet our exacting requirements, we use our expertise, process knowledge and understanding to get the best solutions. We can then supply these to the composite industry worldwide. We required a combined dust and fume extraction unit that could be used wet and dry in an environment with un-skilled trainees. 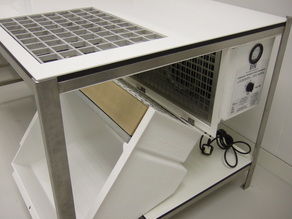 Painted and perforated tables with horizontal filters and expensive ATEX parts were not the right way to go. Within a few weeks we had developed a prototype and we now have the only solvent fume extraction units on the market that can extract solvents using non ATEX parts. These products have been independently analysed and risk assessed by SIRA (a hazardous area certification body) and are now used in the composites industry. With the ever increasing use of carbon and glass fibre composites for large structural applications, there is an increasing need to repair these structures in-situ or on-site. To this extent, dust needs to be captured at point of source. 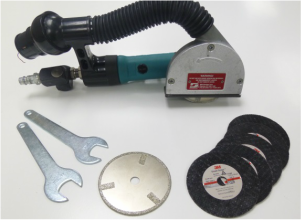 Through an extensive programme, we developed a modified Dynabrade router with special cutting heads and jigs that can be used to prepare step sanded repair surfaces in less time than a standard scarf repair surface with greater accuracy. We also developed modified Festool & Dynabrade portable extractors that could guarantee dust was captured at source with no risk of becoming airborne. 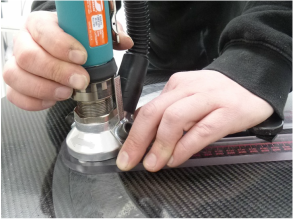 Through our evaluating of air tools with and without on-tool extraction for composite repairs, we know what works effectively with composite materials and what doesn't. All our kits are supplied in the configuration we would use them, giving the best solution with most flexibility. We can also provide ‘best practice’ advice and training to support these products. All our air tool kits are supplied with male hi-flow airline connections and swivel airline connectors as standard for best performance of the tools. Where tool kits are supplied with vacuum shrouds these are also supplied with hose swivel connectors and adaptors to ensure full compatibility with our range of portable dust extraction units. Dynabrade and Festool provide the best air tools and portable extraction on the market. Combined with our expertise in processing advanced composites, we are now specialist technical partners for both Dynabrade and Festool. Where a company needs a process solution, we have either developed it already or will work to develop a solution that is the most effective for the customer.